One of the best ways to recognize and count our blessings is to be a blessing to others. I believe this helped them to learn to be compassionate. It is also a way to be the hands of Christ. You see, I believe when we are available and willing to be a blessing to others, the blessing is really ours. No matter how rough life can be, there is always someone out there going through a storm harder than ours. Volunteering really helps keep things in perspective. I am not suggesting to help others for selfish gain, but I can testify to this… you can NOT out give God. As a single mom, I know the struggles of trying to provide on my own. There were times I would not eat dinner to be sure there was enough for my daughter. One particular time when I was broke, I mean B.R.O.K.E.! I was worrying, God how am I going to do this? He told me to give. So I did. I gave out of my need. I went through my pantry and anything I had two of I put in a bag and gave it away to a family that was also struggling. I am not telling this to you so I can look good, or so you will think I am such a great woman of faith, I was just trying to be obedient and trusting God. Don’t you know, someone showed up at my door later with groceries for me! This is how God works. He gets it to us, through us, and then back to us. He is a faithful Father. He is a loving Husband. He provides for His own. I think sometimes we struggle to see our blessings, because we want what our hands provided. If we work hard, get the paycheck, then we can provide for ourselves. But, don’t you know, even that comes from God. Be a blessing to someone today. 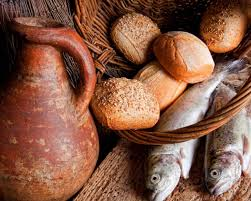 Even if it is from your own need, even if it is just a couple fish and some bread. Be the hands of Christ and watch what He does. There are many opportunities out there everyday. Make yourself available for Him to use you. Do it cheerfully. Let us not forget, it is His goodness that calls us to repentance, so be about His business to a world who needs Him. Be Jesus to someone. Each act of faith is a stepping stone toward increasing our faith…and our pleasure in God. The thrilling thing is when God adds His “Wind” to our “little” and pulls us into so much more than we could ever have brought about ourselves. Yes, He takes our morsels and multiplies them. It is amazing how much our little steps of faith show us how faithful God is… He is so very faithful. Beautiful truth. Reminds me of an expression, “We are blessed to be a blessing and when we bless others, we are blessed ourselves.” You can’t out-give God, indeed! I sent you a PM on FB, check your other folder. I think that the more love and kindness that we put out into the world, the more we receive. This story is a perfect example.